First of all this is not normal to start SQL Server in single user mode. So if you are reading this blog by getting this as a search result, you might be in a tough situation. In some situations, like restoring system database or during disaster recovery you may need to start SQL in single user mode. Okay, so you have started SQL Server in single user mode by specifying start-up parameter “m” either by net start MSSQLServer /m or via command prompt sqlservr.exe –m –sInstanceName but when you are trying to connect via any tool (SQLCMD, OSQL, SQL Server Management Studio or any other) you are welcomed by error message. Error message is clear that someone “else” has made connection to SQL Server and due to /m switch, SQL is not letting you get in. Now, logically there are two ways to fix this problem. Ask SQL Server to not to allow anyone except me. Second one sounds more easy. So let’s discuss that. If you want to know the root cause of “why its in single user mode” then go back and look for SQL Error Log and you may find something as below. In above Errorlog, we can see additional start-up parameter and warning that SQL is in single user mode. If you want to use Management studio only then it would be m"Microsoft SQL Server Management Studio – Query". Once you have started SQL Service in Single use mode then only SQLCMD application can connect and other connection would get error message. 2013-12-06 09:13:50.80 spid4s SQL Server started in single-user mode. This an informational message only. No user action is required. 2013-12-06 09:14:32.93 Logon Error: 18461, Severity: 14, State: 1. 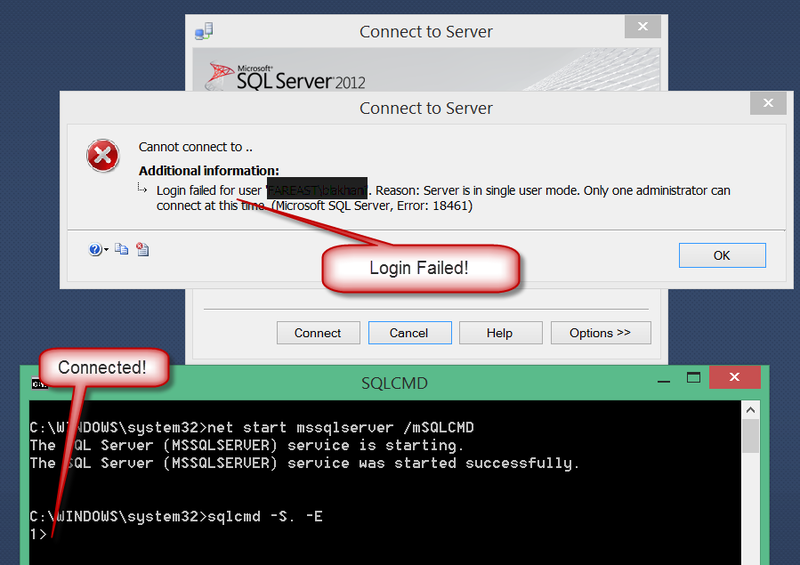 Hopefully this blog would help you in making a connection to SQL Server without stopping application, changing password, disabling account as there were the tricks I have seen to get into SQL when only one connection can be made and unfortunately that’s not you.